Looking for a USED TEMPERING FURNACE UNLOADING SYSTEMS? High Speed Servo Gantry Shuttles With Servo Rotation, Vertical Axis, etc. The Glassline core division is the premiere U.S.-based manufacturer for the glass fabrication industry. 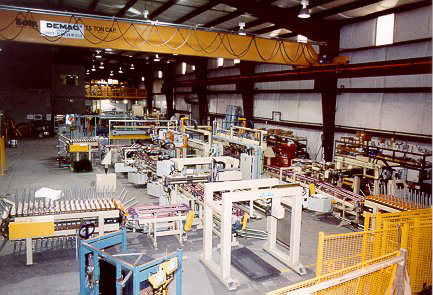 Our product line includes nearly all types of machines needed for fabricating flat glass, including cutting & breaking, grinding, drilling, printing, and handling machines & systems. Our equipment can be installed as stand-alone machines, or can be integrated into complete lines. We are known for producing heavy-duty, high performance equipment that will provide many, many years of service. If you require a special machine to solve production issues or to give you an advantage over your competition, our engineering team can work with you to create a solution and/or our manufacturing team can produce it to your specifications. We are more than just a supplier. We strive to become our Customers' partner, presenting them with innovative equipment solutions to their production problems or future requirements through cooperation and customization. Looking to Purchase a New GLASSLINE TEMPERING FURNACE UNLOADING SYSTEMS?